Thailand’s aptly chosen nickname captures the charm and easygoing temperament of the Thai people. The hospitable nature of the people, their rich culture, and the sheer physical beauty of the land have caused this small Southeast Asian nation to grow rapidly in its attractiveness to the West. The Christian, however, might sense that beneath this smiling facade, few Thai people live with any spiritual hope. Thailand has for many years suppressed the truth of the gospel, and its people exist in a perpetual cycle of fatalism and apprehension of the spirit world. A spiritual people on the whole, many Thais express their religious devotion through offerings to spirits and images of Buddha, and by seeking merit through good deeds. 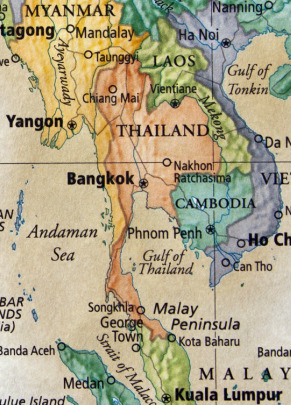 Mission to the World ~ Thailand exists to extend the kingdom of Jesus Christ into the kingdom of Thailand, where the harvest is plentiful and the workers are few. It is our fervent desire that the Holy Spirit will work mightily to bring the Thai people into relationship with the true and living God of all times and places, and to give them a hope that does not perish, spoil, or fade. Please pray for the great nation of Thailand and her people created in the image of Almighty God.